Chanukah, also known as Hanukkah, is celebrated this year at the sundown of Friday, December 11th, until December 19th, 2009 (or year 5770 in the Jewish calendar). The holiday is on a different day each year, due the the lunar calendar; last year it started on Christmas. Chanukah is also a Festival of Lights; the first candle is lit tonight! The word “Chanukah” means “dedication” in Hebrew, the language of Israel. The holiday itself is a commemoration of the re-dedication of the holy temple in Jerusalem during the revolt of the Maccabees. This time took during the 2nd Century BCE. The Jews were suffering oppression under the reign of Antiochus IV, a Greek ruler, who controlled what is now Syria, Egypt and Israel. He prohibited the practice of the Jewish religion and massacred those who adhered to it. This caused the revolt. After they got the temple back, the Maccabees only had enough olive oil to burn for one night, but this oil ended up burning for eight nights. 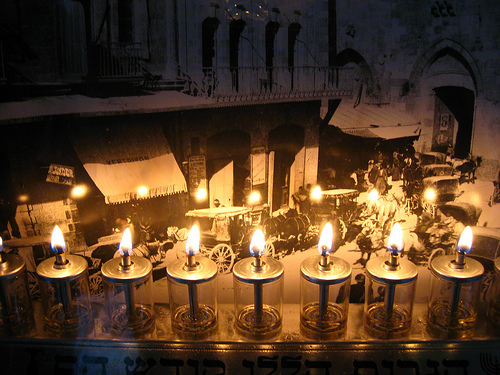 Jews light a different candle on the menorah each night of Chanukah, and recite a prayer. There is also a center menorah candle, the shamash, used to light the other ones. It is usually placed a little higher or lower than the remainder of the candles. People usually place their menorahs by the window sill, on display. In Israel, there is a torch relay from Modi’in to Jerusalem. Public squares also hold giant public menorahs. 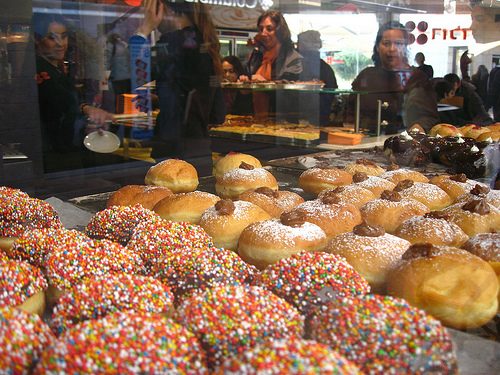 Around this holiday, people like to cook latkes, or potato pancakes, as well as bake jelly donuts, or sufganiot. Other oily and dairy foods, like cheese, are common. Children play with four-sided tops with Hebrew letters, or dreidels. There is a game that goes along with the dreidels, where people play the odds with their chocolate coins, candies, tokens or raisins. Chanukah is not the most important Jewish holiday. Most Jewish and Israeli shops and businesses remain open, but pretty much everyone acknowledges that the holiday is in session. It’s more celebrated in the United States, especially among Jewish families that have younger children. It’s become known as a form of “Jewish Christmas,” and has been a secularized holiday. Even so, it doesn’t have nearly as much significance as Christmas does to Christians. 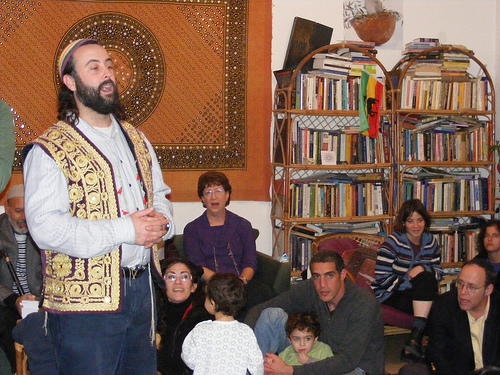 Nevertheless, it is a well-recognized event in the Jewish religion and culture. There are many English Chanukah songs that are sung during this holiday season.